The code is not very elegant and it can be made far more efficient. At present there are no checks to see if the command issued to the ESP8266 is successful or not. Ideally, each command should be checked to see if a “busy” reply has been received and if so, the command resent. If a cipsend command is incorrect or not successful, the ESP8266 waits for the command to be completed and any subsequent commands will get a busy reply. The only way I have found to get out of this is a hard reset. In a future version I will connect the ESP8266 reset to the Arduino so I can control is from software. The module is not as quick as I expected and I often get busy replies. To counter this I have used 2 second delays on each command but sometimes this is still not enough. Another issue, I sometimes get extra messages from the ESP8266 after the page has been sent. I know absolutely nothing about http and don’t know where these come from. I haven’t had time to look in to this and for now I have added extra getReply()s at the end of the code to absorb any extra messages. Remember that the ESP8266 expects all AT commands to end with the carriage return and newline characters (\r\n). Station Mode (ST). The ESP8266 acts as a wifi device & can connect to a network / Access Point. Access Point Mode (AP). The ESP8266 becomes the network (AP) and other devices can connect to it. ST & AP Mode. The ESP8288 is both an AP and a station at the same time. In this mode the ESP8266 will have 2 ip addresses. AT+CWJAP is used to join a network. NetworkSSID is the name of the network and password is the password. AT+CIFSR returns the ip address of the ESP8266. In the example below this is assigned by the router when it joins the network. AT+CIPMUX=1 tells the ESP8266 to allow multiple connections. This is required when using as a server. AT+CIPSERVER=1,80 starts a server on port 80. Port 80 is the normal port for web pages. CIPSEND is used to send data to the ESP8266. AT+CIPSEND=0,25 tells the module to expect 25 characters using channel id 0. You can download the sketch at the bottom of the page. // connect to the network. Uses DHCP. ip will be assigned by the router. // this is the +IPD reply - it is quite long. // or you can just search the data character by character as you read the serial port. // drop to here and wait for next request. I had a typo in the original sketch; AltSoftSerial uses the Arduino pins 8 and 9 (not 9 and 10). Pin 8 is Rx and pin 9 is Tx. I have updated the sketch. 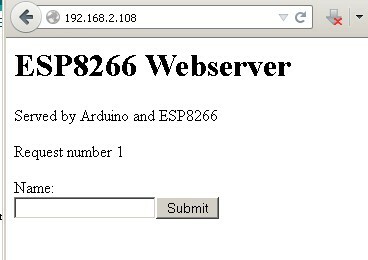 This entry was posted in Arduino, ESP8266 and tagged arduino, ESP8266, webserver by Martyn. Bookmark the permalink. Great job, it work on my arduino pro mini. This is the most detailed tuto i found on the web. Hi! Thanks for the tutorial. Would anyone give me a hint how to use two serials at the same time? The above sketch uses 2 serials; hardware serial to talk to a host PC and the serial monitor and AltSoftSerial to talk to the ESP8266 module. AltSoftSerial has the pins hardwired to D8 and D9 (there was a typo in the above sketch, Arduino D9 is TX and D8 is RX. 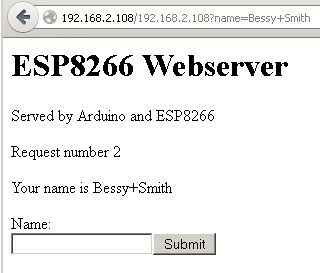 Arduino TX goes to ESP8266 RX and Arduino RX goes to ESP8266 TX. Remember the ESP8266 is 3.3V and you should use a voltage divider on the Arduino TX line. Arduino RX can be connected directly to the ESP8266 TX pin. See http://www.martyncurrey.com/?p=1475 for a diagram. You can also use the regular SoftwareSerial which allows you to select which pins you want to use. See http://www.martyncurrey.com/?p=1475 for an example. Thank you! It all started making sense now. Very much appreciated! Also, I’m very curious to see your circuit. Thanks a lot for that well structured and very good example. but one problem is ….i have used this code to show the text to lcd.i’ve done it! !but it can’t print special characters…i:e: it prints ‘+’ sign instead of space…if i send name like “tom brian” in the webserver text box ..it prints “tom+brian”…could u please help…to get rid of it>>. When you send text the spaces are used as separators and replaced with the “+” character. You would need to manual change them back; search name for the “+” and change to a space. could u please help me with the code…it will be so kind of u.
all you need to do is check for the “+” when copying the name and change it to a space. *The above has not been tested. Thanks a lot …it’s working…but special characters shows like that.i:e: (for ‘ ! ‘ it shows ‘ %21′ ). This looks to be an issue with how the characters are encoded on the website although they display OK for me. It runs ok for the setup() part for me. But I can’t connect to it. I write 192.168.1.32:80 on my browser on a machine connected to the same network and… nothing happens. Does the ESP8266 connect to the local network OK? Check that the ESP8266 is visible. Use a network scanning tool to scan for wifi devices. your last suggestion was working for space..but what for others..? You need to check for the % character and when you get one you know the next 2 characters are the hexadecimal value of the special character. Great job, it work on my arduino uno. This is the most detailed tuto i found on the web. I have a question, I want to send a voice file to web server. Do you know how to build a code for this? This is beyond the scope of the above guide. If you have not already, join the Arduino forum and ask there. You should get the help you need. I have added links at the top of the post. I would like to know if there are new libraries of arduino for ESP8266 and how to find them, i saw your links but i would like to find them just like you did. Google: Arduino + Esp8266 + library. Amazing and very informative stuff. Really very helpful for my arduino project. Thanks for sharing a great post with us. Many thanks for this example but it takes a very long time to load the page. Why the long timeouts on every getReply and would it hurt to reduce them to the 200ms range? You can change the wait time by changing the value in getReply(). A better method would be to wait for the reply and use the timer as a time out. Be aware that this is a very old example that I wrote shortly after the ESP8266 modules were available and there are better examples available. Google for arduino + esp8266 server. Thank you so much.It really helpful me. when we set esp8266 01 as a access point we have a ip address. And when we set esp8266 01 as a station(client) we have another ip address. In the above example the ESP8266 is used in station mode. This means it acts like any other wifi enabled device and is allocated an ip address from the router. When used as an access point (AP) you can think of the ESP8266 as a router that other devices can connect to directly. In this mode the ESP8266 allocates ip addresses. I doubt it but I have actually tried. Give it a go an see what happens. is it possible to assign ip address for the esp? In the above example the IP address is assigned by the router. If you mean you want a static IP address, one that you specify in the code than have a look at https://github.com/esp8266/Arduino/issues/1959 or google esp8266 static IP address. There are lots of guides online.